Is it actually spring yet? I know it technically is, but what with the extremes of both the bleakest winter AND the hottest summer in the space of a few weeks, the weather, like everyone else, seems confused. However, in our house we are *definitely* coming to the end of four years of building work, so it seems like a good time for a spring clean of the fun kind, e.g. rearranging everything on shelves, not hitting the dust off the carpets, outside, in the style of the last century. 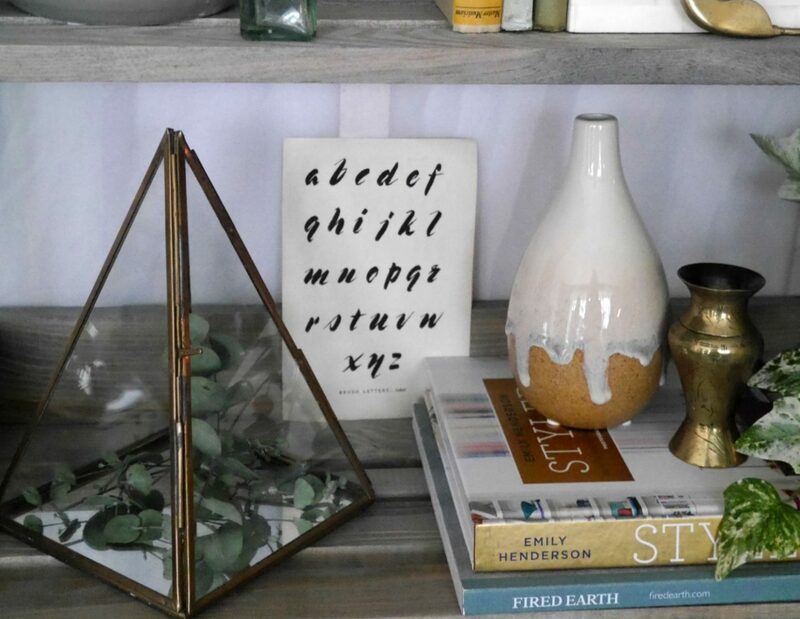 A few weeks ago I headed to a home refresh workshop with Amara, to learn about tips for home styling for spring. 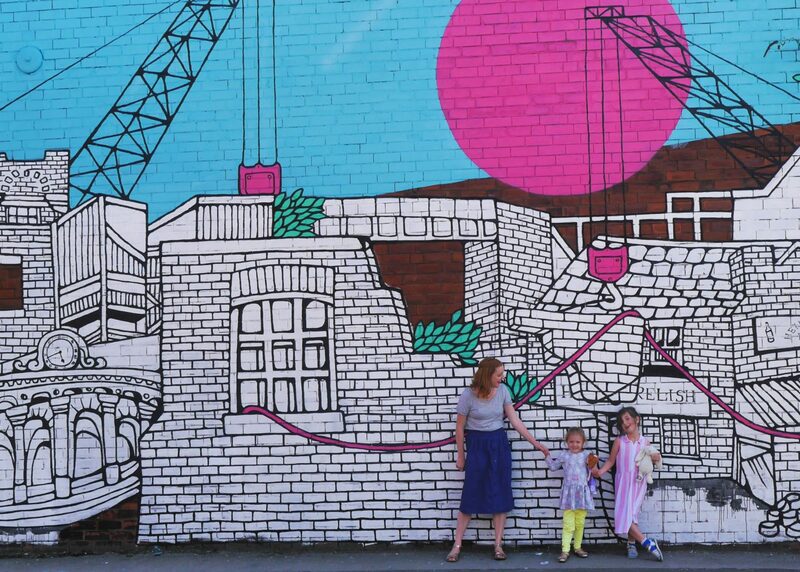 As a parent of small children, I find I have a constant battle between wanting to have a lovely, stylish, tidy house vs the overwhelming avalanche of children’s stuff – and building dust – so any tips sounded brilliant to me. 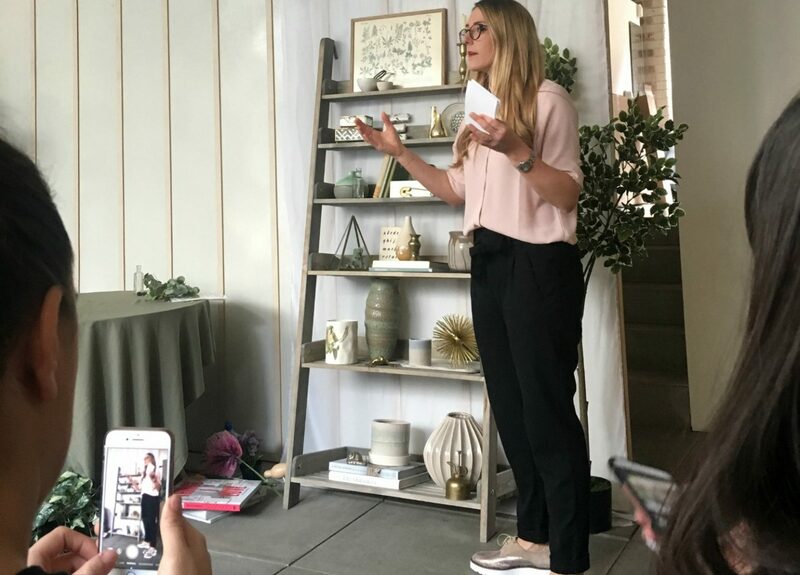 Firstly, how amazing was the house the home styling workshop was in? It was an old warehouse / art gallery that’s now an actual home, with a whole load of exposed brick and industrial features. There were also Amara products dotted around everywhere. I would have happily moved in. We got to meet Sam Hood, Creative Director and Founder of Amara, to hear more about the company, and also heard from Amara’s in-house interior stylist Elle Taylor. 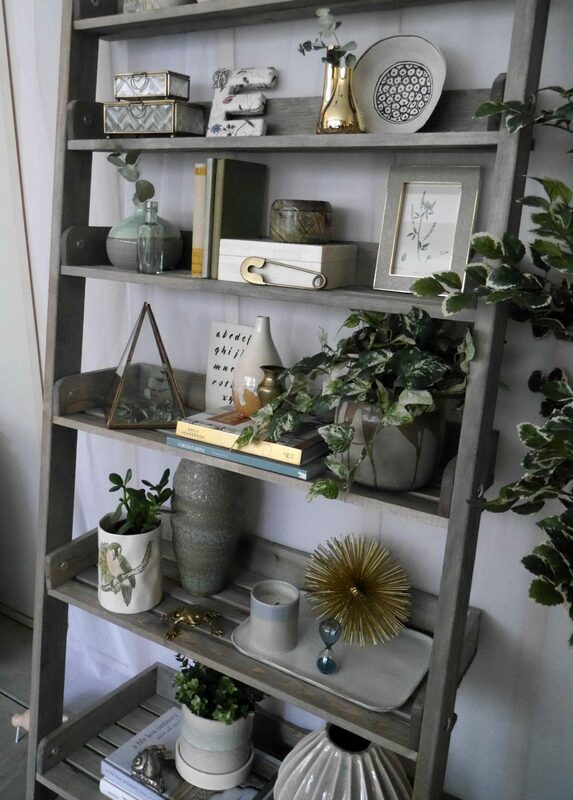 Elle demonstrated how to style products around your home for display by styling up a plain ladder bookcase with the accessories. Start with a theme: This may sound obvious, it also may seem like it doesn’t apply to you when you have a house of children’s stuff with no coherent order. It also doesn’t have to mean a strict or cartoon-type theme, but instead an overall idea or similar products to tie everything together. We saw some of the Amara themes, including the ‘greenhouse’ theme, which was botanical and beautiful. Pick a colour scheme: Again, another obvious one – but Elle recommended picking 3-4 main colours and working with those. 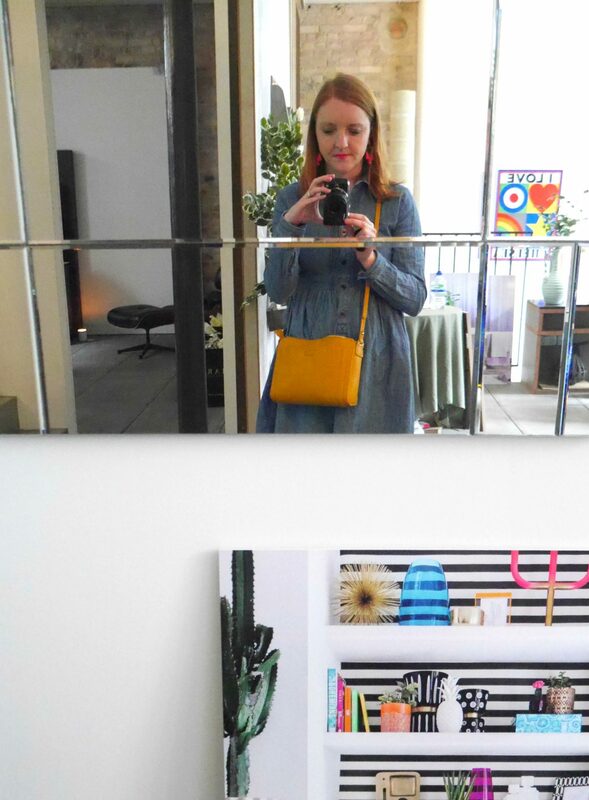 I love using colour in our house – and on my Instagram – but there’s definitely potential for it to look like a rainbow gone wrong. Use the rule of odds: Always arrange things in groups of odd numbers (I always tend to use the most widely known one, groups of three, but Elle suggested groups of five or more, or one). She also mentioned the pyramid rule, where the highest point should be in the middle of the display to draw the eye. Start simple and layer it up: Elle recommended starting with bigger objects and the ones that are more neutral (she also recommended keeping the background neutral but using art as a backdrop). And then, layer up smaller, more interesting objects on top. Always add in personal touches: As an example, Elle showed her metal frogs which she adds into Amara photoshoots to give it a quirky, personal touch. Other things she recommended included using greenery to add depth (are you a serial plant killer like me? Use fake plants instead). She also said to stack books horizontally not just vertically to add interest, and to walk away and come back if things aren’t quite right. We were also invited to pick products from Amara’s home accessories collection to style up in our house after. 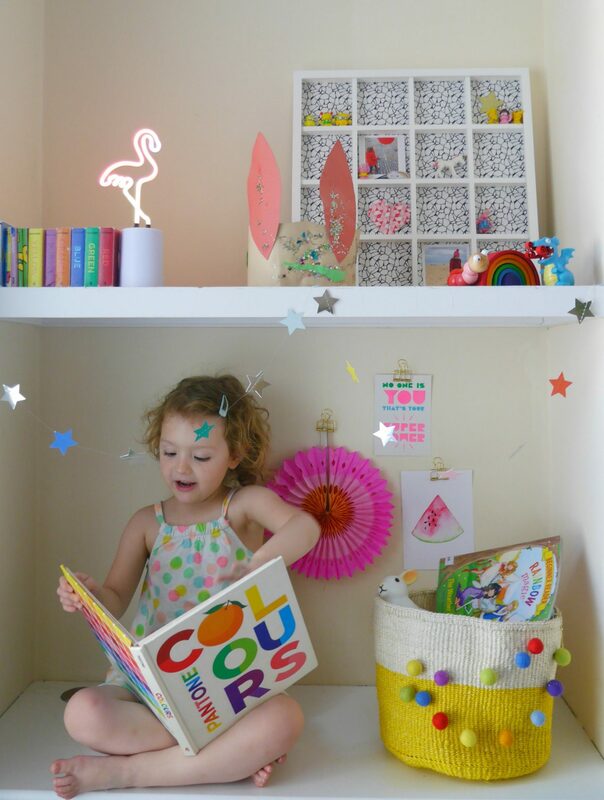 Florence’s room, in particular, her alcove shelves, are definitely in need of a re-organise, so I picked things that would work well there. 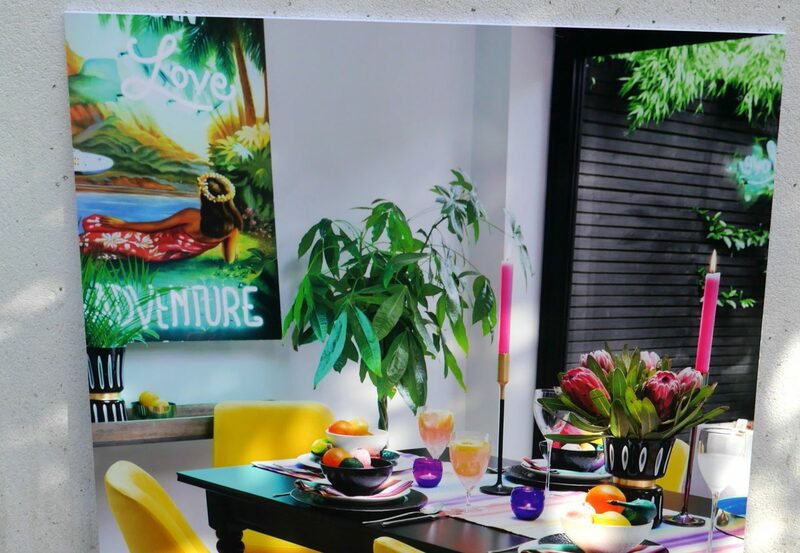 As per Elle’s home styling tips, I picked products with a theme (colourful and eclectic) with pink and yellow as the main colour scheme. 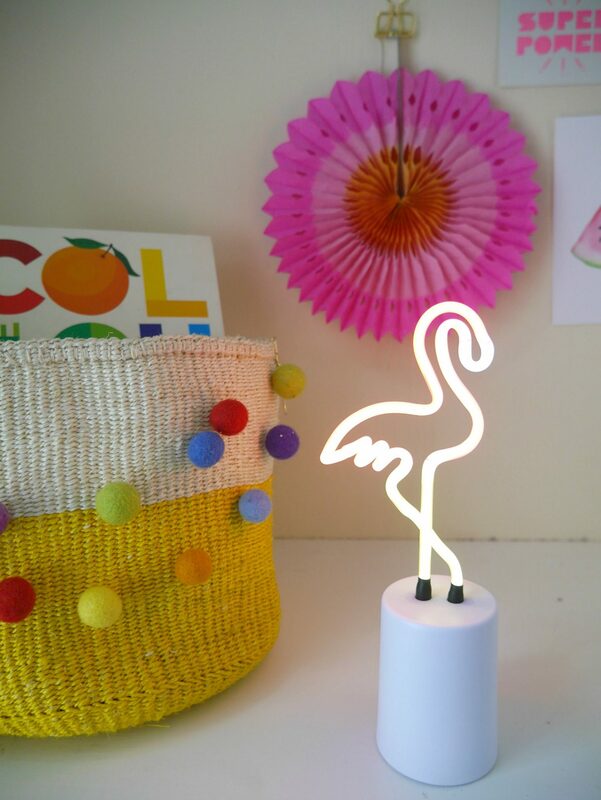 Flamingo neon light: I have a thing for neon lights – we have a heart shaped one in our side return kitchen extension which we all, pardon the pun, really love – So the minute I saw this flamingo I knew it needed to come and live with us. This one is also battery / USB charged which means no wires in the way, which is a bonus for children’s rooms. I’ve used it here as a bookend for all the little books that never really have a home. Yellow woven basket from The Basket Room: Because let’s face it, storage is so, so vital when you have children and I thought it would be useful here and anywhere in the house, for everything from Lego to books. This basket was handmade and hand dyed in Kenya by ethical weaving co-operative The Basket Room, so it has a brilliant backstory. I also used the metal clips I mention below to decorate it with our felt ball garland. Umbra gridart display frame in white: This is a glass-fronted frame, designed to display photos in an insta-style grid. Instead, I’ve turned it into a display cabinet for tiny treasures (I removed the glass front and then changed the stock image background to a black and white design, and then gathered up all the tiny things lying around). I also picked a pack of ten outline paper clips, which I fixed to the wall and used to display postcards and a paper fan, in a group of three and also to fix the felt ball garland to the basket. 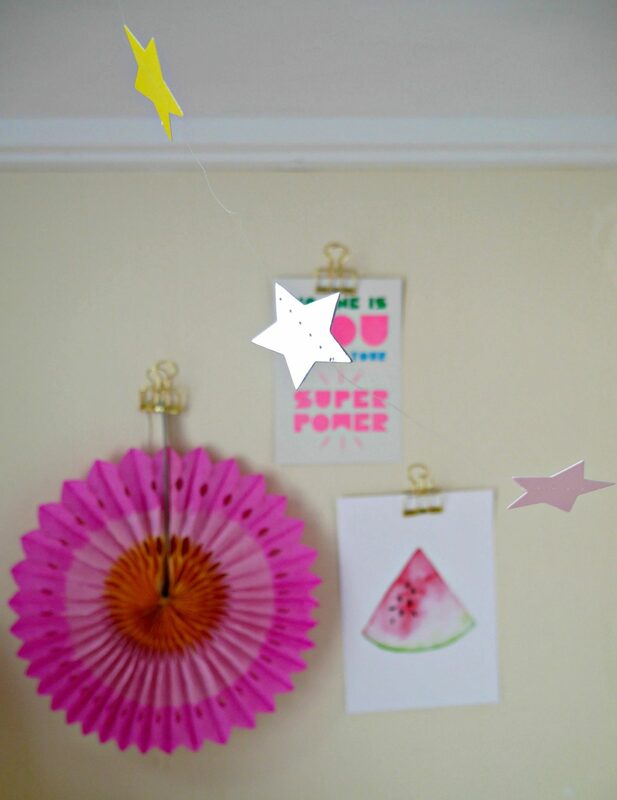 And I used a garland and paper fan from HEMA, along with books, toys and postcards we already had in the room.